This rocket's family name has been launching robotic explorers throughout the solar system for nearly 50 years, revolutionizing mankind's knowledge about the planets and our place in the Universe. From a Cape Canaveral launch pad Friday, the start of NASA's next planetary adventure begins with another Atlas rocket hurling a sophisticated probe away from Earth. Liftoff of the Juno spacecraft on its five-year journey to Jupiter is scheduled for 11:34 a.m. EDT (1534 GMT) aboard a United Launch Alliance Atlas 5. Towering 197 feet tall and generating two-and-a-half-million pounds of chest-thumping thrust, the vehicle will place the 7,995-pound satellite on its circuitous route to the king of planets. Atlas-Centaur rockets have been used since the 1960s to dispatch ground-breaking missions for NASA, including the Surveyors to the Moon, Mariner flights to Mars, Venus and Mercury, and the Pioneers that were the first to visit Jupiter and beyond. In its newest generation, the Atlas 5 rocket sent the Mars Reconnaissance Orbiter to the red planet in 2005, propelled the New Horizons probe toward Pluto and the solar system's outer fringes in 2006 and the doubled up with the dual Lunar Reconnaissance Orbiter and LCROSS impactor to the Moon in 2009. With all that history as a backdrop, the newest robotic expedition to Jupiter is counting on the Atlas for a flawless departure from Earth on Friday. Atlas 5 represents the culmination of evolution stretching back several decades to America's first intercontinental ballistic missile. At the dawn of the space age, boosters named Atlas launched men into orbit during Project Mercury and became a frequent vehicle of choice to haul civil, military and commercial spacecraft to orbit. The rocket launching Juno was born of the Air Force's competition to develop next-generation Evolved Expendable Launch Vehicles. It has flown 26 times since debuting in 2002, carrying out nine commercial flights with communications spacecraft, eight dedicated to the Defense Department, five missions with spy satellites for the National Reconnaissance Office and four for NASA. Atlas 5 was built to be more robust and reliable over earlier Atlas and Titan heavy-lift vehicles, and streamlined production has resulted in fewer opportunities for human error. 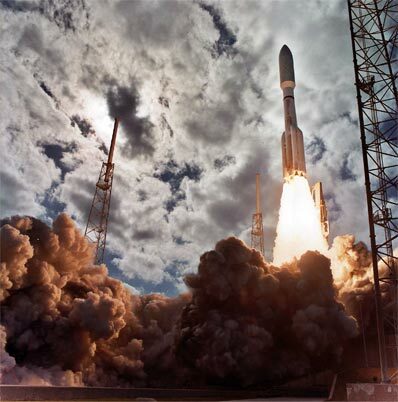 The new launcher builds upon the success of its predecessors, using the Russian-made RD-180 main engine, a stretched Centaur upper stage and its RL-10 engine that were proven during the Atlas 3 program. The key piece that set Atlas 5 apart, however, was the rigid body Common Core Booster serving as the rocket's first stage. The CCB replaced the "balloon" pressure-stabilized stage used by previous Atlas vehicles. 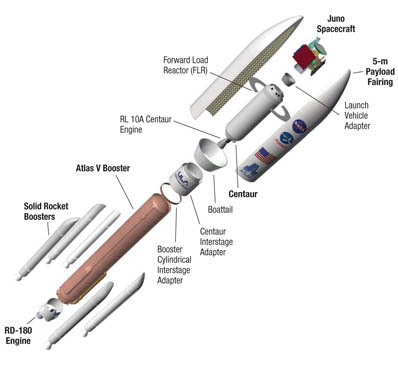 As the CCB's name suggests, the stage is common and is used in all the various configurations of the Atlas 5 family. The booster stage is 106.6 feet long and 12.5 feet diameter. There are three distinct versions of Atlas 5 rockets -- the 400 series, 500 series and Heavy -- each tailored to launching a certain class of satellite. The 400 series uses a four-meter diameter payload shroud and has flown 19 times. The 500 series, distinguished by a five-meter fairing, has launched 7 times. The proposed Heavy is a future Atlas 5 version that would take three Common Core Boosters to form a powerful triple-body rocket. To match an Atlas 5 with the size of its payload, up to five solid rocket motors can be strapped to the rocket to give extra boost at liftoff and the two different types of nose cones are available to enclose the satellite atop the launcher. The various options give Atlas 5 the nickname "dial-a-rocket" because of its flexibility. Juno will fly on the 551 configuration, the most powerful version of the Atlas 5 currently available. This translates to a rocket with the bulbous five-meter fairing, five solid rocket boosters and one RL-10 engine on the Centaur upper stage. The energetic version has been used only once in the previous 26 flights by the vehicle, launching the Pluto-bound probe New Horizons. Powering the Atlas 5 during the first four minutes of flight is the RD-180 liquid-fueled engine. The liquid oxygen/kerosene powerplant is a two-thrust chamber, two-nozzle engine made by NPO Energomash of Khimky, Russia. It was developed from the RD-170 engine used by Russia's Energia-Buran space shuttle, the Energia-M and Ukrainian Zenit rockets. Featuring hypergolic ignition, the engine produces 860,000 pounds of thrust and is throttled up and down to ease the stresses the rocket experiences throughout the launch. And its dual nozzles provides superior steering control during the climb out. Giving the rocket an added kick off the launch pad are five solid-propellant boosters made by Aerojet. Considered the world's longest monolithic -- or single-segment -- solid boosters, the motors provide the extra thrust needed to increase the Atlas 5's payload-carrying capacity. Each booster stands 67 feet tall, has a diameter of just over five feet and weighs 102,000 pounds at launch. The slender white rockets have a lightweight graphite epoxy casing with an erosion-resistant insulation. The solid fuel is high-performance class 1.3 HTPB propellant. Atop the booster is an aerodynamically-shaped graphite epoxy nose fairing. Each motor has forward and aft attachment structures to the Atlas 5's first stage. The motor nozzle is carbon-phenolic. The motor burns for 90 seconds, producing a maximum thrust of approximately 400,000 pounds and an average of 280,000 pounds. The Russian RD-180 first stage main engine can accomplish the entire job of steering the Atlas 5 during launch, thus the solid boosters feature simple, fixed nozzles. RUAG Space of Zurich, Switzerland produces the five-meter diameter nose cone that covers the satellite cargo during the first minutes of launch as the rocket accelerates through the atmosphere. The Atlas 5 shrouds are the largest lightweight composite payload fairings ever built. For Atlas 5's 500-series, the fairings are about 17 feet in diameter. A "short" version, which will be used for Juno, is 68 feet long and weighs 7,800 pounds. A layer of cork is applied to the outer surface of the fairing to shield against the heating of ascent. An electrically conductive white paint is then applied over the cork to avoid electrical charges. The inside has an acoustic protection system to lessen the intense sound during launch for the payload. To give the fairing structural support against lateral loads during the ascent, the "Centaur Forward Load Reactor" deck was designed. This aluminum ring extends from the Centaur to the fairing's inner wall. It separates in two halves moments after the fairing is jettisoned during launch. The workhorse Centaur upper stage has been flown in various configurations for decades. For Juno's launch, the stage will use one Pratt & Whitney-built RL-10A-4-2 liquid oxygen/liquid hydrogen engine that develops a thrust of about 22,300 pounds. The Centaur will fire twice during ascent, initially boosting itself and attached satellite into a parking orbit around Earth after separation from the first stage. A second burn then propels the payload out of Earth orbit to begin Juno's trek toward Jupiter. The stage is 41.5 feet in length and 10 feet it diameter. It also houses the navigation unit that serves as the rocket's guidance brain.